Cutler is expected to retire from the NFL this offseason, Ian Rapoport of the NFL Network reports. Analysis: The Dolphins lured Cutler out of retirement last season after Ryan Tannehill (knee) went down with a torn ACL. Playing on a one-year, $10 million contract, Cutler struggled to elevate Miami's offense and ultimately finished the 2018 season with 2,666 passing yards, 19 touchdowns and 14 interceptions in 14 games. The 34-year-old quarterback wasn't expected to continue his playing career, so his retirement is more of a formality than anything else. Dolphins head coach Adam Gase said Wednesday that he didn't expect Cutler to return to the team in 2018, the Associated Press reports. Cutler will start Sunday's game against the Bills, but backup David Fales is expected to relieve him at some point during the contest, a source informed Adam Schefter of ESPN. 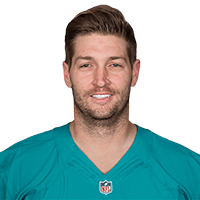 Cutler indicated Wednesday that he's open to the possibility of playing in the NFL in 2018, but likely only if he's given the opportunity to start, Adam H. Beasley of the Miami Herald reports. "I wouldn't want to move again and go somewhere and just to back up," Cutler said. Dolphins head coach Adam Gase confirmed that Cutler would start Sunday's game against the Bills, Armando Salguero of the Miami Herald reports. According to Barry Jackson of the Miami Herald, Gase wouldn't commit to Cutler finishing the contest, however. Cutler completed 19 of 38 passes for 286 yards with one touchdown and no interceptions in Sunday's 29-13 loss to the Chiefs. He also lost a yard on two rushes and fumbled once but recovered. Cutler wouldn't speculate about his future beyond the 2017 season Friday, James Walker of ESPN.com reports. 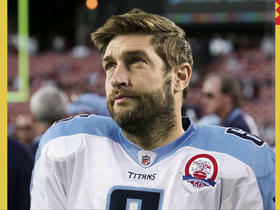 "I haven't thought about it," Cutler said. "You know, I'm focused on [Kansas City]. That stuff will be a concern of mine when the season is over." Cutler completed 28 of 49 passes for 274 yards and tossed three interceptions during Sunday's 24-16 loss to Buffalo. He also fumbled four times during the contest but recovered all four. Cutler completed 25 of 38 passes for 263 yards and three touchdowns in Monday night's 27-20 win over the Patriots. Cutler completed 18 of 31 passes for 235 yards with two touchdowns and two interceptions in Sunday's 35-9 win over the Broncos. He also rushed once for one yard. Dolphins head coach Adam Gase said Cutler has cleared the NFL's concussion protocol and will start Sunday's game against the Broncos, Joe Schad of The Palm Beach Post reports. 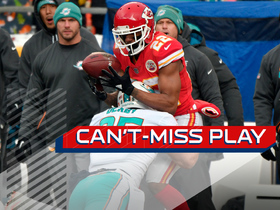 Cutler (concussion) has been ruled out for Sunday's game against the Patriots, Adam Beasley of the Miami Herald reports. Analysis: As a result, Matt Moore will draw his second start of the season, while the report relays that the Dolphins have elected to proceed with caution and shut Cutler down in the short-term, with a reevaluation on tap next week. David Fales is thus slated to back up Moore on Sunday. The Dolphins maintain hope that Cutler will be removed from the NFL's concussion protocol Friday or Saturday, putting him on track to start Sunday's game against the Patriots, Armando Salguero of the Miami Herald reports. Though Cutler remains in the NFL's concussion protocol, he did throw some passes during practice Thursday, Alain Poupart of the Dolphins' official site reports. Cutler remains in the NFL's concussion protocol heading into the Dolphins' practice Wednesday, Adam H. Beasley of the Miami Herald reports. Analysis: Dolphins head coach Adam Gase noted that a decision on the team's starting quarterback for Sunday's game against the Patriots will likely be made later in the week. With that in mind, Gase didn't rule out the possibility that Cutler could play Week 12 even if he's unable to practice. 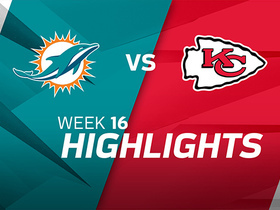 Until Cutler is cleared for full practices, Matt Moore, who relieved Cutler in the Week 11 loss to the Buccaneers, should handle the first-team reps.
Dolphins coach Adam Gase said Cutler (concussion) didn't do anything to lose the starting job in Sunday's 30-20 loss to the Buccaneers, James Walker of ESPN.com reports. Cutler was forced out of Sunday's game against the Buccaneers after being evaluated for a concussion, the Palm Beach Post reports. He will not return to the contest. Analysis: Cutler who completed six of 12 passes for 83 yards, with a TD and three picks prior to his exit, was replaced in the contest by Matt Moore. Cutler will now look to gain medical clearance as next Sunday's game against the Patriots approaches. Cutler completed 22 of 37 passes for 213 yards, two touchdowns and an interception in Monday night's 45-21 loss to the Panthers. Analysis: Cutler's performance marked the fifth time he's averaged under 6.0 yards per attempt in eight appearances this season. 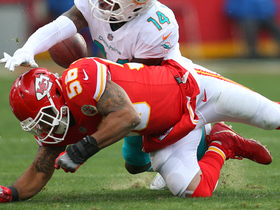 The quarterback found Julius Thomas for a two-yard touchdown during the second quarter, but an interception on Miami's next drive started what would be a rout Monday. Although another touchdown toss during garbage time helped his stock, Cutler will prepare for Sunday's make-up game against Buccaneers with the sour taste of defeat in his mouth. 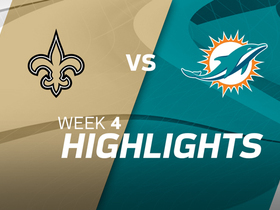 Cutler completed 34 of 42 passes for 311 yards and three touchdowns during Sunday's 27-24 loss to the Raiders. Cutler (ribs) is listed as active for Sunday night's game against the Raiders. Though the Dolphins list Cutler (ribs) as questionable for Sunday's game against the Raiders, head coach Adam Gase previously noted that the veteran signal caller is starting for the Dolphins in Week 9, Barry Jackson of the Miami Herald reports. 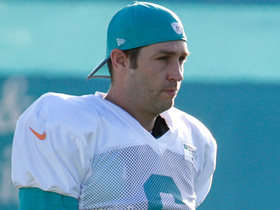 Cutler (ribs) was a full participant at Wednesday's practice, Armando Salguero of the Miami Herald reports. NFL Network's Reggie Wayne explains why he's not sold on Miami Dolphins quarterback Jay Cutler and isn't impressed with his lack of enthusiasm. 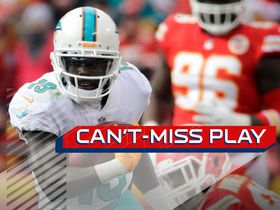 Miami Dolphins wide receiver Jakeem Grant uses speed to take it 65 yards up the field and break through three tackles for a touchdown. 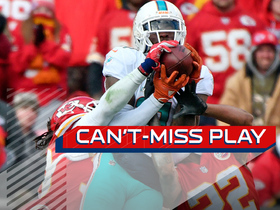 Miami Dolphins wide receiver DeVante Parker leaps for 34-yard catch from quarterback Jay Cutler.